Bring these Disney Movies Home for the Holidays! Pooh, Mickey, Ariel & Jake! These Great Disney Titles Are Available This Month! My family and I are tremendously excited by all the new Disney Holiday releases coming out this month! In my household we're multi-generational Disney fans: Grandpa plays the musical soundtrack to the Disney Parks' rides (The Haunted Mansion, It's a Small World, etc), Grandma breaks out the photo albums of past vacations to Walt Disney World in Orlando, Florida, my husband and I help the kids collect Disney toys and apparel, and the children come running from any room in the house to watch Disney movies! 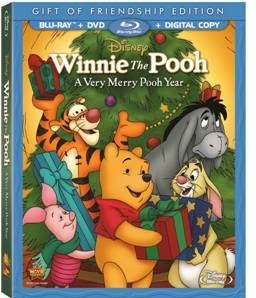 On November 5th both Mickey's Christmas Carol: 30th Anniversary Special Edition and Winnie the Pooh: A Very Merry Pooh Year were released onto Blu-Ray/DVD combo pack! A very special day for fans everywhere, as Pooh and Mickey are two fantastic Walt Disney characters! November 19th will also be a big movie release day for Disney, with The Little Mermaid II & Ariel's Beginning: 2 Movie Collection, Jake and the Never Land Pirates: Jake's Never Land Rescue, and Planes, which you can win a copy of in my Planes contest, here! There's lots of great Disney movies coming on November 19th, so mark your calendar! Out on Blu-Ray/DVD This Week! In my household, we're Winnie-the-Pooh fans and looking forward to watching Pooh and his friends in Disney's Winnie the Pooh: A Very Merry Pooh Year this Christmas season! Look at the photo below to see how crazy we are about Pooh! We have Santa Claus Pooh, two birthday party Poohs, a crawling Pooh, a walking Pooh, a Pooh who shakes a baby rattle, and many, many more! Santa Pooh & Some of Our Pooh Collection! "It’s the most wonderful time of the year, but Rabbit will only discover the true spirit of the season after his pals make misguided New Year’s resolutions to change – with hilarious and heartfelt results! Featuring beloved characters, delightful songs and fun-filled bonus goodies!" 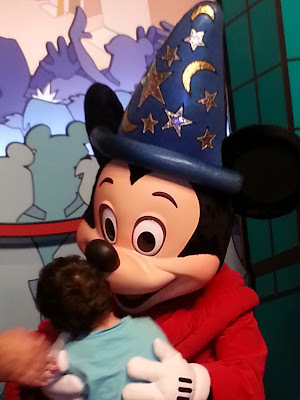 My youngest guy is a huge Mickey Mouse fan, which I only discovered after our trip to Walt Disney World last year! He literally threw himself into Mickey's arms and would not let go! He hugged him and hugged him and hugged him, see photo below! He loves Mickey so much, that for his last birthday he insisted on a life-sized inflatable Mickey Mouse helium balloon. Hugging Mickey Close to His Heart! "The new 30th Anniversary Special Edition of Disney's Mickey’s Christmas Carol, starring Mickey, Goofy and Donald is a heartwarming retelling of Dickens’ unforgettable holiday tale. Ebenezer Scrooge (Scrooge McDuck) is too greedy to understand that Christmas is a time for kindness and generosity. But with the guidance of some wise ghosts (Goofy and Jiminy Cricket) and a bunch of newfound friends, Scrooge learns to embrace the spirit of the season!" Comes to Blu-Ray/DVD November 19th! Disney's The Little Mermaid II & Ariel's Beginning: 2 Movie Collection comes to Blu-Ray/DVD combo pack on November 19th, so put on your mermaid tale and swim over to the store to get your copy then! 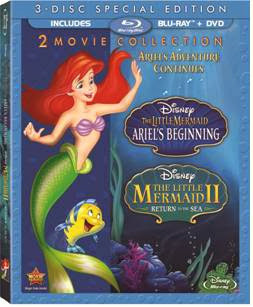 It is a great gift for your The Little Mermaid movie fan, Ariel enthusiast, or Disney Princess lover! 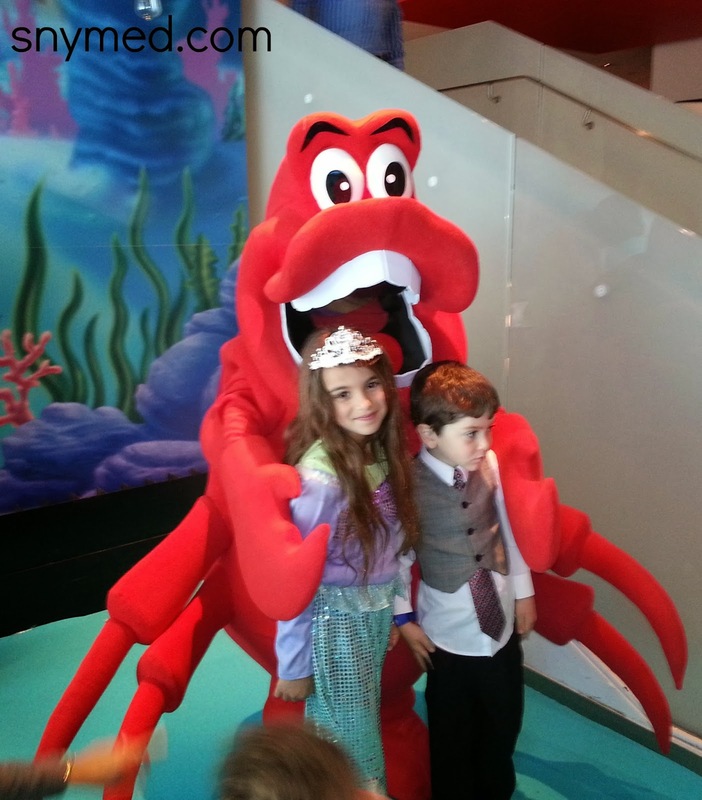 My Kids With Sebastian From The Little Mermaid! "Your favorite characters from The Little Mermaid continue their adventures in this enchanting sequel to one of the most celebrated animated films of all time. Even though her parents tell her merpeople and Atlantica are just “old fish tales,” Ariel’s daughter, Melody, dreams of being part of that magical world. In an unforgettable story that will take your breath away, all the good creatures on the land and under the sea must join forces to show Melody that both her worlds can live in perfect harmony." "Ariel (The Little Mermaid) reveals the extraordinary events that led up to her transformation into a princess! Long before Ariel walked on land and into Prince Eric’s heart, she was one of seven beloved daughters of powerful King Triton. But times were troubled in the underwater kingdom – and music was banned! In this magical adventure, Ariel, her fun-loving sisters, and her loyal friends Sebastian and Flounder strive to bring music and friendship back to Atlantica." Comes to DVD November 19th! 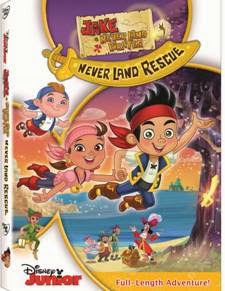 Our good friends Disney Junior Canada are releasing Jake and the Never Land Pirates: Jake's Never Land Rescue to DVD on November 19th! Does your little one enjoy Jake episodes, pirate adventures or gold doubloons? Then this full-length adventure is sure to be a hit! 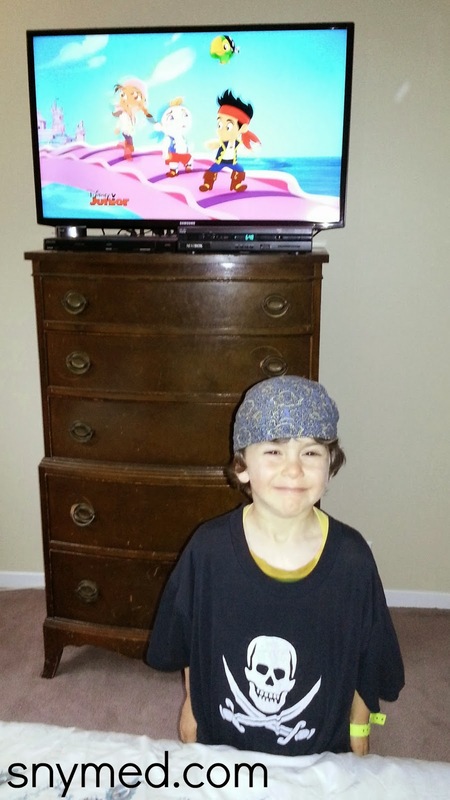 Check out my son, below, all decked out in pirate gear to watch Jake and the Never Land Pirates! It's twice as fun to get dressed up for the show and then watch it, clearly! "Jake embarks on his most heroic mission ever as the magic of Never Land begins to disappear just as the ancient Forever Tree seems to be fading away. After a mysterious figure known as "The Guardian" arrives to explain that only the pirate who truly believes in himself can save Never Land from vanishing completely, Jake must break off from the rest of his crew and go alone on a mission to save the Forever Tree, the source of magic throughout all of Never Land. Guiding Jake on his quest is Tinker Bell, who makes her first-ever appearance in the series!" 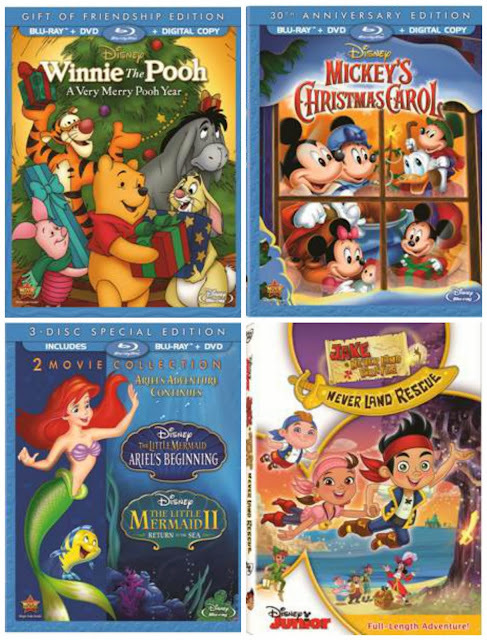 If you are hoping to purchase these fantastic Disney titles for Christmas, then snap them up now and put them aside for later. So many items that I've been seeking for the kids are already sold out--one month-and-a-half early! Which new release Disney movie listed above are you most excited about (Pooh, Disney, The Little Mermaid II, Jake and the Never Land Pirates, etc)? What was the first Disney movie you ever saw? These look like awesome movies, although I dont think Ill be getting them for xmas. My hope is to purchase frozen for a christmas present. I am so excited to see Mickey's Christmas Carol - such a fabulous movie. Can't wait to show it to my boys and start a new holiday tradition. Awesome post. I love all these movies! I can't wait to sit down again and watch them. We have already watched Winnie the Pooh: A very merry Pooh year and Mickey's Christmas Carol like 10 times this year. I love the Christmas movies! I haven't seen either of those Little Mermaid's (just the original) and my boys love all things Jake! Every year I must watch Mickey's Christmas Carol! I've been watching it every Christmas for as long as I can remember. Love these movies! You can't go wrong get your kids disney movies for and occasion as they will always watch and enjoy them over and over again! What a great set of DVDs. I think I might check out Mickey's Christmas Carol. We tried to watch the original Christmas Carol and I think the ghosts of the past, present, future really scared my son. Hopefully the mickey version is not quite as scary for him. I wish that they would reissue "Mickey's Magical Christmas: Snowed In At the House of Mouse" on dvd. I only have the vhs, and it's wonderful. 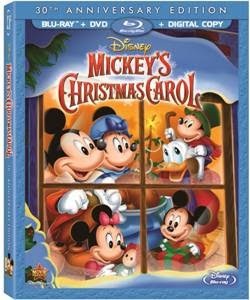 It features "Mickey's Christmas Carol", along with a lot of other Disney holiday cartoons!